Garden of Evil (1954), directed by Henry Hathaway. On their way to the California gold fields by ship, three likely characters (Gary Cooper, Richard Widmark, Cameron Mitchell) are stranded in a small Mexican coastal town. 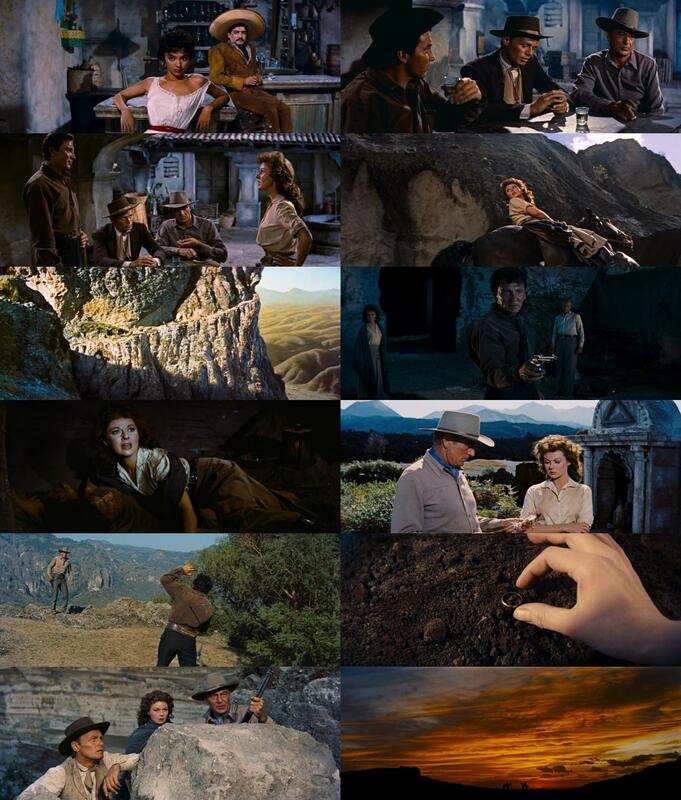 Frantic, pistol-packing Susan Hayward hires them to help rescue her husband, trapped in a cave-in at their mine. (It's many days journey each way; he must be durable). She leads them through a deserted, almost prehistoric Lost World wilderness landscape. The typically fine Bernard Herrmann score really punches the fantasy aspect. Their destination is a town submerged in lava; the mine is just beyond. Hostile Indians lurk but we don't see them until the final running and fighting segment. They do rescue the husband (Hugh Marlowe, last seen in Twelve O'Clock High (1949)) but his experience has left him kind of crazed. In particular he seems to hate his wife. "You came back" he says, amazed. They got in; can they now get out? This is all pretty well done, but the dialogue and relationships are weaker, declining into jumbled psychodrama. For an eclectic film survey you could do worse than watch a selection with Bernard Herrmann scores. This was his only western feature film. The DVD commentary track has four film music experts discussing Herrmann and the history and practice of movie music in general. In those days the director had nothing to do with the music. The composer worked for the studio music director, in this case the great Alfred Newman, a fine film composer in his own right. The irony: studios in those days were derided as a "factory" system, but the composers had individual styles. Today, it's much more of a sameness in film music because too many people have to be satisfied. Sam Fuller said the same thing from the director's point of view: moguls were better than layers of committees. The experts point out the evil of the "temp track". Directors want to set a mood during filming and use already known music on set. They fall in love with it and when it comes time for scoring want something "just like that". Herrmann refused to work with a temp track, even when it was his own earlier music. Later: Twilight Time produced a Blu-ray and the thumbnails are taken from that. The commentary track hosted by Nick Redman is brought forward from the DVD. That's Rita Moreno, age 22, in the first image below.